Pot culture offers advantages when raising America's most revered backyard crop. Want to achieve perfect bliss? Try this: an onion bagel with melted cheddar cheese, a fat slice of homegrown tomato, salt and pepper. Simple, yet exquisite. One bite and you're several steps ahead on the road to enlightenment. Close your eyes and hum the mantra: "yum... yum." Before one reaches nirvana, however, one must grow the tomato. No easy feat for many of us here in the maritime northwest. To be successful, the coastal gardener must select early-ripening tomato varieties, wait to plant them out until the soil warms to 55°, find a sunny bit of garden, stake the vines, and hope to harvest a few precious fruit before late blight raises its fungus-infested head. Clearly, it helps to have a few tricks up one's sleeve. Far and away the best trick I've found is growing tomatoes in containers. Pot culture offers many advantages when raising America's most revered backyard crop. First of all, the risk of late blight is greatly reduced if fresh potting soil is used each year. (The old soil can be reused in other containers for any plants except tomatoes, potatoes, or eggplant.) Even my laissez faire watering practices – which often involve soggy foliage and late afternoon watering – have neglected to produce late blight in my tomatoes in the five years I've been potting them up. 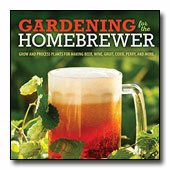 Second, this is a great system for the lazy gardener. Growing tomatoes in containers works better than all the red plastic mulch, wall-o'waters, pruning, and hoop houses I've ever tried. I don't even bother to stake the plants; they just spill over the sides. Another plus is that the pots can, and should, be placed in sunny places with lots of reflected heat, often where ground planting would be impossible, such as on walkways and driveways. Hint: raising the containers off the ground with pot feet will avoid water damage to the underlying hard surface as well as reducing slug habitat. Tomatoes seem to prosper in these confined conditions. While my "control group" of Legend tomatoes is busily growing to the size of small shrubs in the vegetable garden, their smaller, containerized counterparts are already getting down to business. The plants' social nature allows me to get the most out of each container by growing two plants in the larger pots (22"x17"), and three in a couple of gigantic ones. Finally, if you have a heated greenhouse or sunroom, pots with unripened tomatoes can be hauled inside at the end of August or early September to provide vine-ripened fruit into November. To begin you'll need a collection of containers at least 18"x14." I'm fond of tacky, black plastic tree tubs, but small plastic garbage cans with wheels are a handy alternative (purchased new for the purpose and holes drilled in the bottom). If you consider garbage cans a bit pricey for the purpose, remember that they will last for many years. Each one will hold two deeply-planted tomato starts, and can be wheeled around, if required. Whether cans or tubs, any lack of elegance is quickly concealed beneath the growing vines. Fill your container of choice half full with fresh potting soil and amend with a copious amount of alfalfa meal or pellets. But pay heed and learn from my mistake: though tomatoes love the alfalfa, too much--more than a quarter the total volume of the growing medium--will cause the alfalfa to hot-compost and cook the young vines. Determinant tomatoes are often recommended for pot culture because of their shrubby habit and self-limiting season. However, indeterminants perform just fine for me and are the ones you'll want for those aforementioned November tomatoes. I grow some of both. As far as which individual varieties to grow, I've yet to find one that didn't do well in a container – and I grow at least a dozen different plants per year. Of course, in our area early-ripening varieties are always your best bet. 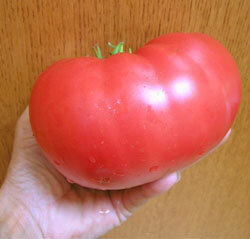 Tomatoes can be planted out around Mother's Day when all danger of frost is past. At my house, the pots get a full-sun situation by our paved drive. The vines can be planted deep, with only the top two or three sets of leaves aboveground; remove leaves that otherwise would be buried. Roots will sprout all along the buried stem. Tomatoes are one of only a handful of plants that tolerate, much less appreciate, such treatment. 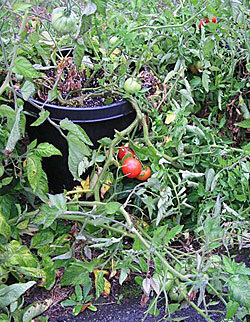 When grown in containers, tomatoes are relatively easy to cover if a cold snap threatens. The soil shouldn't be allowed to become soggy while the plants are becoming established; on the other hand, the soil must never dry out completely. As summer wears on and the plants mature, that will most likely mean daily watering. Once fruit-set has begun, feed every couple weeks with Miracle-Gro or fish fertilizer. You may also want to sprinkle iron phosphate slug bait beneath the pots to minimize damage to the fruit by marauding gastropods. That's all there is to it. There's nothing left to do now but buy a big basket in which to reap your summer-long bounty. Don't forget the onion bagels. Wendy Tweten is an avid hobbyist gardener and writer living in Kingston, Washington. She is at least halfway to her goal of trying one of every kind of plant that can be grown in zone 8. Wendy studied horticulture and nursery management at South Seattle Community College. As a freelance writer, she specializes in home and gardening and Real Estate topics, and is a regular contributor to many Kitsap County and Seattle area publications. She is a member of the Garden Writers Association and her humor column is published in the Kingston Community News.